While the Apostle Paul waited for his companions to come from Macedonia his spirit was provoked or upset because he observed “the city full of idols” (Acts 17:16). There were many idols in Athens, but none more impressive than those on the Acropolis. The word acropolis means the “high point of the city.” The name was applied to any fortified strong hold or citadel overlooking a populated area. It served as a place of refuge and defense. The Acropolis is 512 ft. high. The Royal Ontario Museum in Toronto has a nice exhibit of Greek artifacts and a helpful model of the Acropolis with its magnificent buildings. Click on the photo for an image suitable for use in teaching. Model of the Acropolis at Royal Ontario Museum. Photo by Ferrell Jenkins. The Parthenon where the goddess Athena was worshiped was built between 447 and 438 B.C. Temple of Athena Nike (Wingless Victory, 5th cent. B.C.). The Erechtheion with its porch of Caryatids was built between 421 and 406 B.C. An olive tree beside the building commemorates the first olive tree planted by Athena. Temple of Rome and Augustus. Temples were built to Athena all over the Roman Empire. 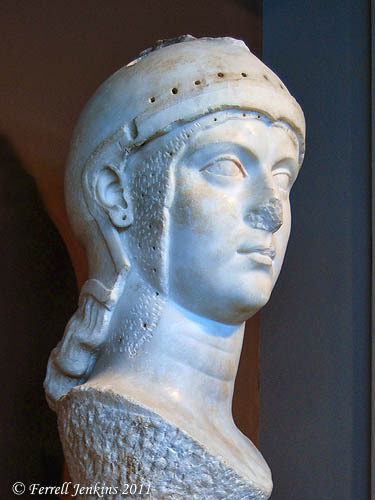 This photo of a bust of Athena was made in the Archaeology Museum of Thessalonica (Thessaloniki, Greece). Athena. Archaeology Museum of Thesaloniki. Photo by Ferrell Jenkins. Paul described gods and goddesses like Athena as having been formed by man. This entry was posted in Bible Places, Bible Study, Greece, New Testament, Photography, Travel and tagged Apostle Paul, Athens, Roman Empire. Bookmark the permalink.